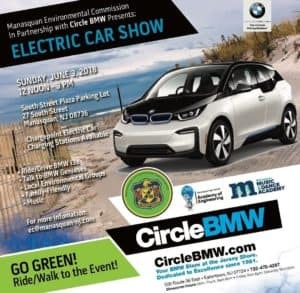 In Partnership with the Manasquan Environmental Commission, Circle BMW presents the Electric Car Show on June 3rd 2018. Please join us from Noon to 3:00 P.M. at the South Street Plaza Parking Lot (27 South Street Manasquan, NJ 08736). Chargepoint Electric Car Stations will be available for your use! We will be featuring our BMW i3 models. You are invited to test drive, and talk to our BMW Geniuses.